Having stamped the Blazing Poppies I die cut it with labels 28 and then cut a mat in brushed silver with Spellbinders Enchanted Labels 28 . I used 'Itsy Bitsy' backgound stamp and a dragonfly stamp with Tattered Rose distress ink, I also used 'Square Peg Round hole' background stamp with bundled sage ink but because I used second generation ink in doesn't show up very well in the photo. Well I had better get a wiggle on and get myself linked up to Indigoblu challenge blog ... it is so worth taking part as there are stamp plates for the winner. 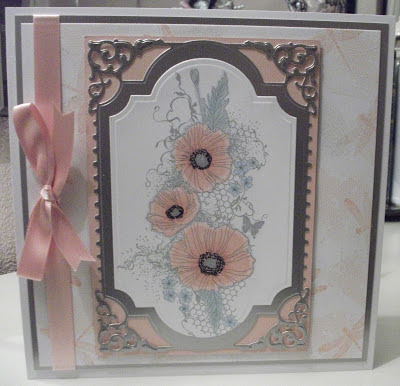 Really delicate and lovely, beautiful card!